Remember eating those home made krispie thingys as a kid. You know the ones I’m talking about. The cereal treat that you used to make as a kid with your mum or grandma or just by yourself just because. I always used to make chocolate covered rice krispies or cornflakes and put them into little cases, patiently waiting for them to set. I still make them now, but there is no waiting patiently involved. As soon as I cover the cereal in the chocolate I’ll eat it there and then. Still warm and melty but verry crunchy. I even made them at a house party once for ‘breakfast’ simply because there was nothing to eat. No butter, no jam, no bread, no anything, so I couldn’t even make toast. I raided the cupboard and found some cereal and chocolate and I knew I just had to make some chocolate krispies. These krispies saved me from dying from starvation. I couldn’t even be bothered to let it set as usual. Of course this is much better than toast. The American version of krispies has marshmallow into the krispies, which is a bit like those treats Squares from Kelloggs, which now come in a plethora of flavours such as Caramel, Rocky Road and Honeycomb. The rocky road and honeycomb didn’t exist when I was little. One thing I never really understood is why they were called Square when they were actually rectangle? Anyway make to the indulgent krispies. 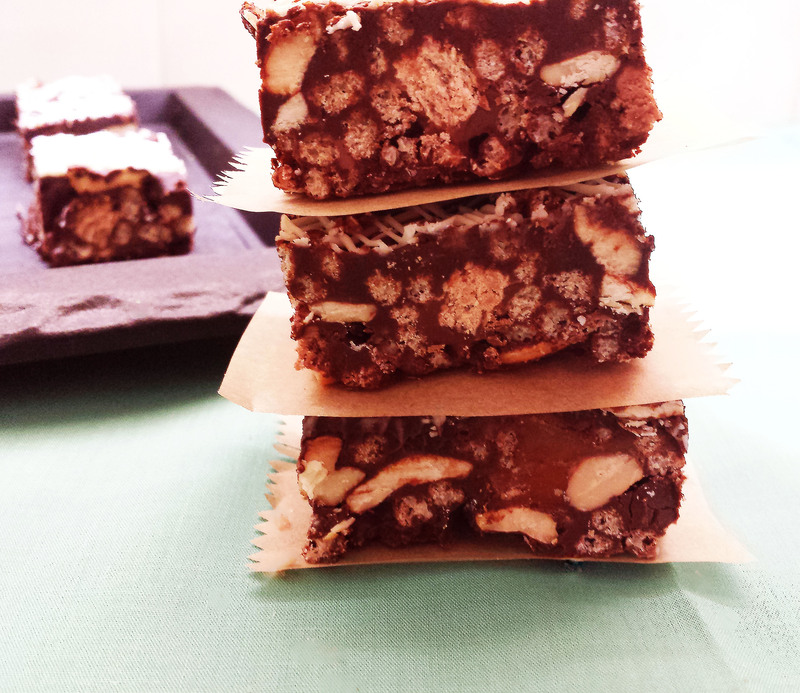 These chocolate indulgent krispies use quite a fair bit of chocolate. Chocolate candy pieces covered and coated in chocolate. Basically it’s a chocoholics dream! When constructing the chocolate indulgent krispies I wanted each candy bar that I added to give a unique texture to the krispies. The Mars bar is soft and chewy from both the nougat and caramel, the Kit Kat is crunchy, the Malteaser dissolves on your tongue. It’s just a mish mash of textures. The chocolate indulgent krispies are so addictive, I struggled to keep away from the and managed to eat 5 before I even took a picture! 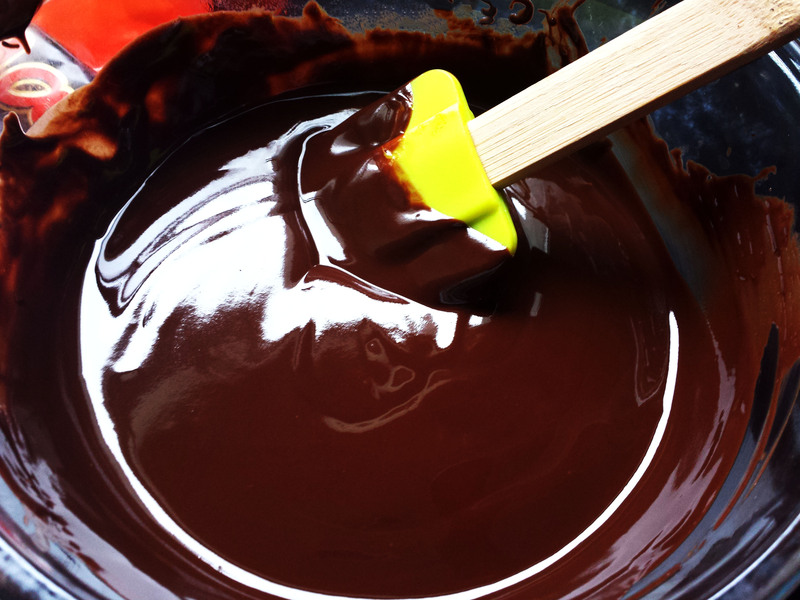 You will need a napkin or wet wipe after you have finished as the chocolate starts to melt all over your fingers. Then again you could use your tongue to lick the chocolate off your fingers. 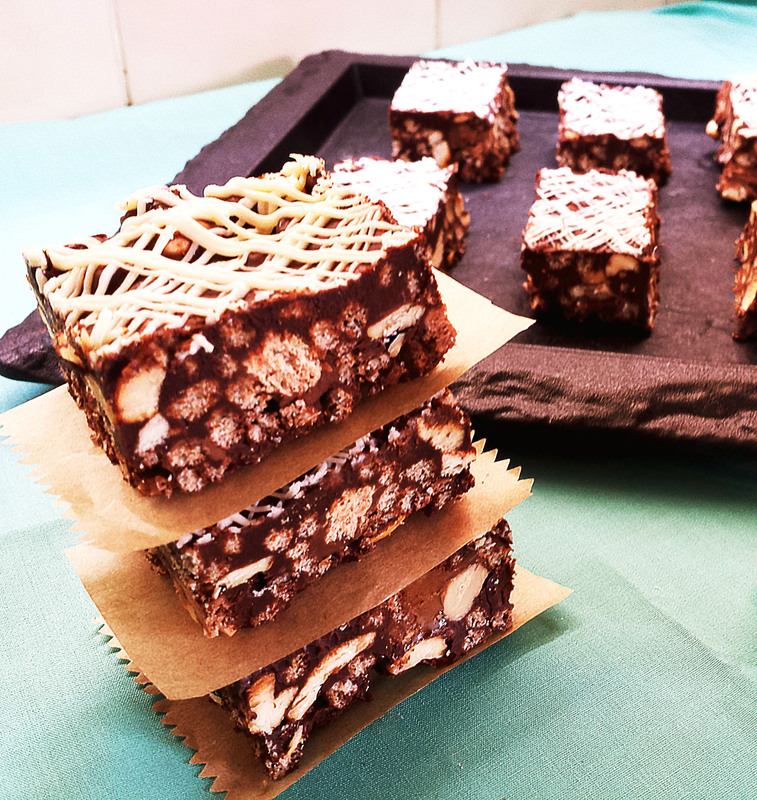 Line a square baking tray with greaseproof paper and set aside. Melt the milk and dark chocolate with the butter and golden syrup over a double boiler. When melted remove from heat and allowed to cool slightly. 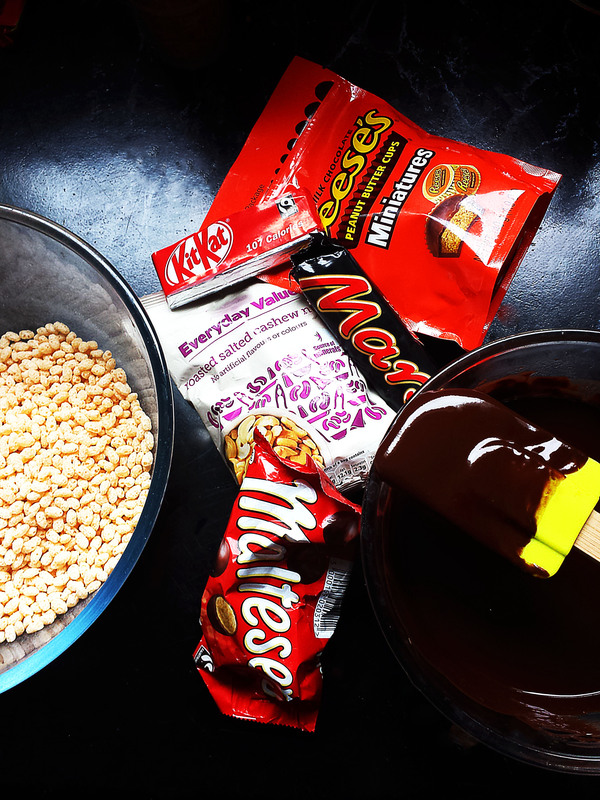 Add the cooled, but still warm chocolate to a bowl of krispies, leaving a few tablespoons behind. Start to mix, then add, the nuts and chopped chocolate bars. Pour into the lined baking tray ad press to even out the mixture. With the remainder of the chocolate spread over the top of the mix. Sprinkle on the sea salt and leave to set in the fridge for 3+ hours to set. For the decorative drizzle… Melt the white chocolate in over a double boiler, then drizzle over the krispies and put back in the fridge to set. 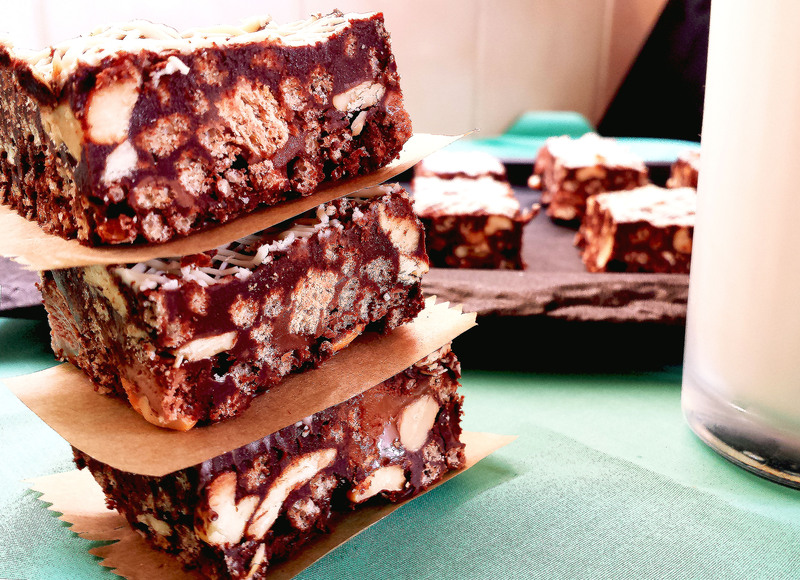 Cut the krispies into bars and serve. Use a good dark chocolate with 70% cocoa. I used a chocolate with 78%. If you don’t have rice krispies on hand, use a similar cereal such as cornflakes. For extra chocolate goodness use a chocolate cereal such as cocoa pops. You can substitute the salted cashews for salted peanuts, almonds or pistachios. To make the bars easier to cut, dip your knife in boiling hot water. Wipe with a napkin and cut. The warmth from the knife will melt the chocolate slightly, making a cleaner cut.